In the spring of 2015, just a few months after Charleston was born, Luke received a job offer from a company in San Diego, about two hours south of where we were living in Orange County. The offer was a dream come true for Luke: he had always wanted to move our family back to his college town, and this was his chance. Though the timing wasn’t ideal, the prospect of a higher salary with an exciting start-up company seemed too good to pass up. And yet, it didn’t feel quite right. Luke and I agonized over the decision of whether or not to take the job. We spent countless hours making Pro & Con lists, imagining alternative futures, and weighing the merits of relocating to San Diego or staying put in Orange County, where I’d lived my whole life. In the end Luke took the job and we spent a weekend in San Diego looking for a house to rent. We found a gem of a home that would be perfect for our growing family, and put in an offer, then were shocked when the owners went with another family. This happened not once, but twice, and we began to realize San Diego wasn’t meant to be. Luke retracted his acceptance and we decided to stay in Orange County for a while longer. At the time, the whole ordeal felt shrouded in frustration and confusion: why would God put this opportunity in our path, only for the doors to be closed? Now, four years later, the entire situation makes perfect sense. If Luke hadn’t been offered the San Diego job, we never would have been receptive to the notion of leaving Orange County. Not only did the experience open our minds and hearts to the idea of moving, it also paved the way for Luke’s company in Orange County to allow him to work remotely, essentially enabling us to move anywhere in the country. The pieces all came together (albeit with a few more bumps along the road), and less than a year later we relocated to Austin, Texas, which I now know is EXACTLY where God wants us to be for this season of our lives. Our near-move to San Diego wasn’t the first time I had to trust God with a murky future, and it certainly wasn’t the last. And though God worked the entire story into one more amazing and beautiful than I could have imagined, I wish that at the time we’d had a wise counselor to walk us through the intense decision making process. . . someone like Emily P. Freeman. For nearly a decade, Emily Freeman has been one of my favorite “soul whisperers.” Emily’s stated goal for all of her content is “to create space for your soul to breathe so you can discern your next right thing in love,” and her work has indeed been a revitalizing breath of fresh air for me in various stages of my life. 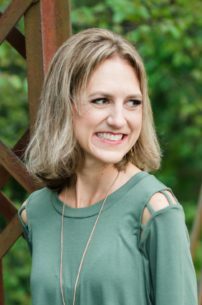 Through her books and her blog, Emily has pointed me to Christ and shown me how to invite Him into the minutia of my daily life. Emily’s work has helped to awaken a reflective, intuition-driven side of me that I didn’t know existed, and that I couldn’t live without. A few years ago, Emily found herself in need of some soul guidance. She felt the inkings of a new project welling up inside of her, and as a bestselling author, she assumed this was the beginning of her next book. For months, she tried to write but couldn’t. Eventually she realized the “key to unlocking the mystery that was keeping [her] stuck. As it turned out, this material didn’t want to be written, it wanted to be spoken.” In August 2017, Emily released the first episode of The Next Right Thing podcast. As someone who has listened to the podcast from the very first episode, I can attest to what a gift her show has been to the podcasting world. Each brief episode is spoken in Emily’s calm, reassuring voice, with weekly topics designed to help listeners clear the decision-making chaos and focus on doing the next right thing, in love. I couldn’t have been more thrilled by Emily’s announcement this past year that her podcast was becoming a book! As a member of Emily’s launch team, I got my hands on an Advanced Reader Copy, and y’all—this book positively blew me away! In each of the book’s twenty-four brief chapters, Emily addresses a different aspect of decision-making, from becoming a soul minimalist and naming the narrative, to staying in today and refusing to rush clarity. She shares stories of how these practices have played out in her own life and guides readers in incorporating these steps into our own decision-making. I had no idea how complex and important decision-making could be, but with each new tool presented I found myself thinking, “Yes! This is where I’ve been going wrong in my decision-making. I’ve been ignoring this! I didn’t know!” At the end of each chapter, Emily offers a prayer and a practice that leads readers closer to God and to making the next right decision. This book is for the indecisive, for those plagued by chronic hesitation and decision fatigue, and for anyone facing a big decision . . . or even a series of small ones. As Emily points out, “it doesn’t matter what the specific decision is. 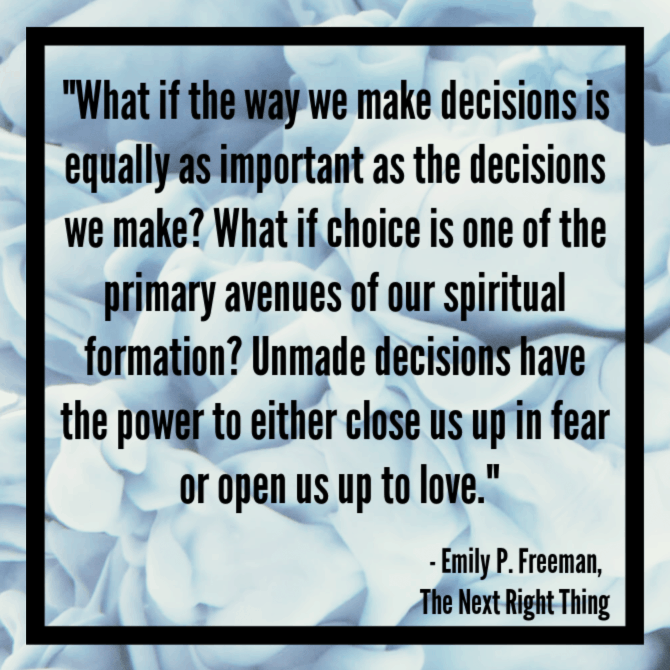 Unmade decisions hold power. They pull, they push, they interrupt where they aren’t wanted and poke us awake at night. They can turn us into strange versions of ourselves.” We can’t allow these decisions to rule over us any longer, and Emily’s words offer the guidance many of us need. But Emily also reminds readers that, “the decision is rarely the point. the point is you becoming more fully yourself in the presence of God.” When we turn to Him through each step of the decision-making process, we grow closer to Him and allow Him to do a great work in us. Luke and I are currently in the midst of one of the most anxiety-ridden seasons of our married life. Our little world is filled with uncertainty and decisions that are needing to made. In other words, this book couldn’t have landed in my hands at a more perfect time. Emily’s steady, reassuring words have been a lifeline for me, helping me find peace when life feels chaotic and pointing me to a Savior who has promised to walk me through this difficult time. I lost count of the number of times a passage from The Next Right Thing brought me to tears, because it was JUST what I needed to know in that moment. I took screenshot after screenshot of passages I wanted to share with Luke and he, too, found comfort and guidance in Emily’s sage advice. 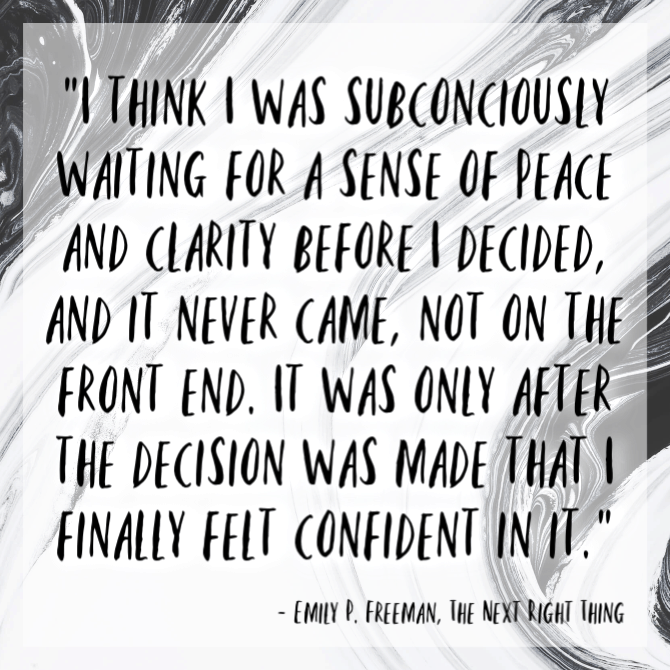 The Next Right Thing is helping me make peace with my own lack of clarity, while also empowering me to make each next right decision that needs to be made. I relished every line in this book, and I trust you will too. 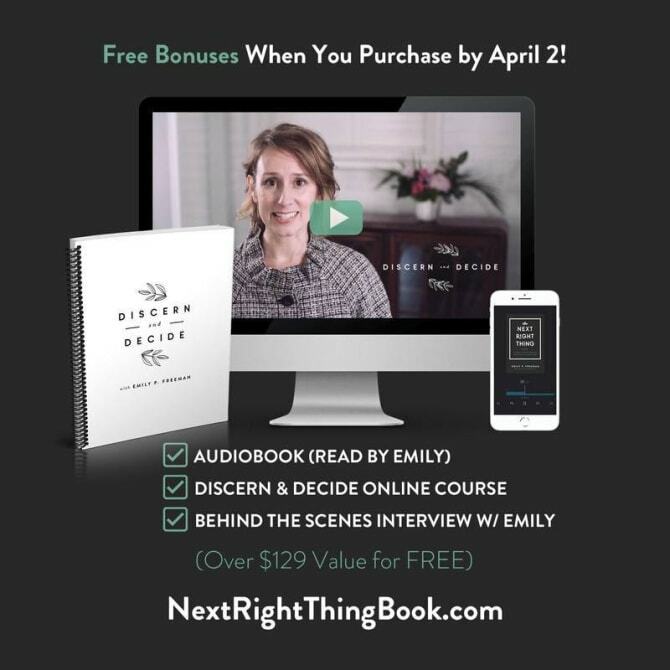 The Next Right Thing goes on sale April 2, but if you preorder now, you gain access to several free bonuses, including a free version of the audiobook and enrollment in Emily’s Discern and Decide course. 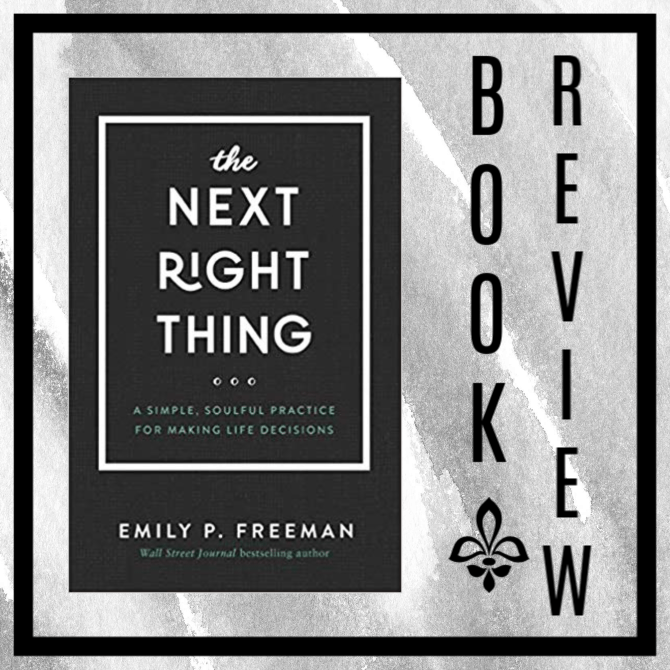 While you await the book’s release, be sure to check out The Next Right Thing podcast which covers much of the same content as the book. (In fact, many of the book’s chapters are lifted straight from the podcast archives, but even as someone who has listened at least twice to every episode of The Next Right Thing, I still found it helpful to have the information laid out in a book.) You can also head here to take a fun quiz to determine your decision-making style (mine was Gut/Intuition).